Get cash for your car in a matter of minutes. Slow credit? Bad Credit? No Credit? No problem! Borrow the cash you need today. We can lend up to $100,000 on an auto title loan. Keep driving the family car. Your vehicle is your asset. Turn your car title into cash. Get cash NOW with a car title loan. Emergency Expenses or home repairs? Bills piling up? Contact us today. Already Have A Title Loan? Get Out Of High Monthly Payments. When we’re in financial disparity, we don’t exactly have the luxury of shopping around for lower rates, lower payments, lower interest rates, or even just seeing what are options are. This usually leads us into loans with not so favorable terms, and high monthly payments. If you haven’t figured it out by now, Phoenix Title Loans, LLC can help you out! While most other title loan lenders in Arizona will leave you with an egregious monthly payment, and the attitude “if you want cash, it’s my way or the highway,” Phoenix Title Loans is different and does not hope to bankrupt our customers, but to help them out of unfortunate situations and will always work with them as best we can to find a monthly payment that works for them. We Can Refinance Your Auto Title Loans! If your payment is too high, or your interest rate is too high, or maybe your title loan lender is just inconvenient for you to travel to and make your payment – we can help! In the vast majority of these situations, we’re able to help our customers through lowering their monthly payment – often drastically! The best part about this transaction is the fact that we handle all the grunt work for you. If you’d like to refinance your auto title loan, we take care of your old title loan lender so you can wipe your hands clean. The best thing about refinancing with Phoenix Title Loans is that we take all the hassle out of the situation. We’ll deal with your previous company, handle all the paperwork with them, and smooth along the process so that from that point on you only have to make payments to us. With eleven valley wide locations, we can easily find one that is convenient for you to make the process even easier. For just about any traditional loan a credit check is always mandatory, and can severely impact your chances at getting the fast cash you need. At Phoenix Title Loans, we don’t discriminate based on one small number. Our title loans are credit check free meaning if you have no credit, bad credit, bankruptcies, anything that other institutions have turned you down for, Phoenix Title Loans will not. The beauty of an auto title loan is that it’s a form of collateral loan in which your vehicle is all the confidence we need to give you money. Between Jobs or Self-Employed? We Still Have Cash For You! Phoenix Title Loans is happy to help those who have fallen into a rough patch as we know these things are temporary. Aside from credit score, another large determining factor when trying to get a loan is your employment and income status, meaning when you’re out of a job or are self-employed the process gets exceedingly difficult. At Phoenix Title Loans, we’re happy to work around these kinds of situations and still provide cash to our customers with an auto title loan. These are the times that you’re going to need cash the most, and Phoenix Title Loans is here to help the communities that have allowed us to remain in business for so long. No matter how unique your situation might be, we’re happy to help you evaluate your options at no cost to you and find a way to get you your cash. Need Extra Cash For Car Repairs? We’ve all been in fender benders, but maybe you got into a fender bender so drastic that, unfortunately, your poor car is now sporting a salvage title. When you take this car to most auto title lenders, they’ll turn you away very quickly due to the salvage title. If you haven’t gotten it by now, then you’ll get it this time, Phoenix Title Loans, LLC can get you your money! Salvage titled cars are okay here! Maybe your car isn’t salvaged, great, but maybe it’s still in an undesirable condition and needs repairs and you just don’t have the money on hand to fix it. We can help! Through a trusted repair shop, an invoice of the work, we can get you a title loan and pay for your repairs directly! Every single vehicle has value at Phoenix Title Loans. An auto title loan is a type of collateral loan meaning we don’t have to be picky like many other title loan competitors. Buick, Lincoln, Chevrolet, Toyota, BMW, Honda, Mazda, Chrysler, Volvo, Cadillac, Dodge, Ford, Nissan, you name it, we can loan on it! Depending on the value and condition of your vehicle Phoenix Title Loans can lend you anywhere from $1.00 to $100,000.00 dollars on the spot! This is what makes us the leading provider of auto title loans in Phoenix, Scottsdale, Mesa, and Chandler. Bring in your car, have one of our experts take a look at it, complete a little paperwork and walk out within minutes with the cash you need in hand! If TIME and DISTANCE is of concern, simply fill out our Online Application. Good Credit, Bad Credit, Slow or No Credit is NO PROBLEM at Phoenix Title Loans since your loan is based entirely on the equity and value of your vehicle. That’s right. We will give you the cash you need today with an Auto Title Loan and let you keep driving your car. Provided that you have a clear AZ title, out-of-state vehicle registration and valid state ID or Drivers License, Phoenix Title Loans can accept your vehicle for an auto title loan. Our courteous and professional staff will walk you through every step of the process to make sure you understand and to make the process painless, and hassle-free. We Do All Types of Auto Title Loans! When we say we do truck title loans, we mean it. Everything from Ford F-150s to Nissan Titans to Sport Utility Vehicles such as a Ford Explorer. Are you a small business owner? Do you have a fleet of vehicles for your business, but are owned by the business? We can loan on them! Even if you are a truck driver and have a huge freight-liner, we can do Semi Truck Title Loans too! On top of loaning on any and all average cars, we are also unique from other title loan lenders in the valley in that we can do extremely high value cash loans on vehicles like Mercedes-Benz, BMW, Lexus, even tens of thousands of dollars in loans on brands like Ferrari, Rolls Royce, or even Bentley! That’s right folks, you heard right! Phoenix Title Loans, LLC can even get you a title loan on an RV! No matter if you have an RV, 5th wheel, motor home, travel trailer, toy hauler, pop-up trailer or camper, we can get you a title loan! We also offer Rideshare Title Loan services to those who work for Uber and Lyft! If you need a title loan for car repairs or you just need the extra cash, Phoenix Title Loans can help! This is a solicitation for an Auto Title Loan. This is not a guaranteed offer and is subject to Phoenix Title Loans approval. The actual loan amount is subject to vehicle evaluation by Phoenix Title Loans along with a completed application and verification of customer’s information supplied. All car title loans are subject to the customer’s ability to repay, the actual condition, mileage and overall value of the vehicle. In most cases Phoenix Title Loans does allow the customer to keep and continue driving their vehicle however certain vehicles like boats, personal watercraft, ATV’s and others, at the discretion, may be held as security until the loan or pawn has been paid in full or redeemed. 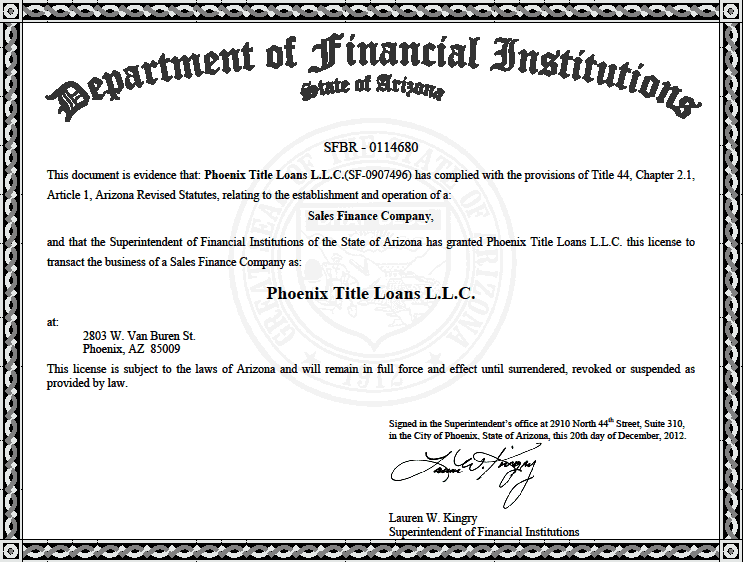 Phoenix Title Loans, LLC is licensed through the Arizona Department of Financial Institutions (license here) and operates only in the State of Arizona. We adhere to all Arizona statutes governing auto title loans (Arizona Revised Statutes (A.R.S.) Title 44, Chapter 2.1, Article 1, and A.R.S., Title 47, Chapter 9, Article 6. (Uniform Commercial Code)) and also Regulation Z of the Truth in Lending Act, a federal law governing title loan operations. Interest rates governed by Arizona Statute 44-291.